© Naturally, the benefits of having a clean nest are as applicable to honey bees as any other animal. Research shows that some diseases as well as pesticides will build up and stay in old brood nest combs. In a wild colony the old brood nest combs are renewed as a result of a relationship with the Greater and Lesser Wax Moths. These moths are considered a pest by the beekeeper but they are beneficial in a wild colony. The moth larvae prefer old brood comb to new wax comb and will quickly eat through any that are exposed at times when the colony population is low, after a swarm has departed for example. The moths do not normally get a chance to perform this function in a kept colony so it is recommended to replace brood nest combs after two years using the Frame Change or Comb Replacement technique. This technique is also a recommended treatment for colonies showing signs of Chalkbrood, Nosema or Amoeba. It also provides the colony with a complete new or sterilised hive as well as allowing the old hive to be renovated and sterilised ready for using again so it can be part of a 3 year program. The technique is best applied in spring or early summer when the colony is naturally building new comb and expanding. Put the new brood box in the upturned roof of the old hive after it is removed. Find the queen in the old hive and remove her with the comb and bees to the new brood box. Position the comb so that it will be above the centre of the brood nest in the old hive when the new brood box is placed on top. 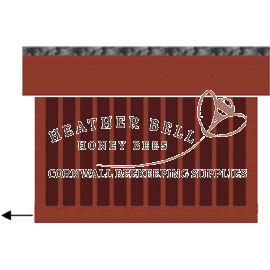 Fill the new brood box with new frames fitted with foundation. The upturned roof will stop the queen from being lost in case she drops from the comb – losing queens is easier than you think. Push the frames together in the old brood box to close the gap then place a queen excluder on top. Place an eke with an entrance on the queen excluder. Ensure the entrance on the eke is open and faces the same direction as the entrance to the old hive which is now blocked or closed. This upper entrance ensures the foragers do not have to work through the excluder and discourages the storage of honey below. Place on the new brood box. Place on a feeder with 50% syrup unless there is a reliable nectar flow. The slight division of the colony caused by the queen excluder can initiate the production of queen cells in the old hive so after 7 days check it and remove any queen cells found. All brood in the old hive will have emerged after a further 14 days. The old hive complete with old combs, queen excluder and eke can then be removed. The old floor could also now be usefully replaced with a new or sterilised one. Place the new brood box on the floor. 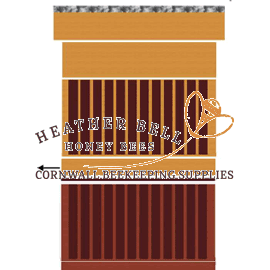 The old comb that was transferred to the new brood box with the queen is now moved to the side of the box where it will not be reused by the queen. All brood in this old comb will have emerged after a further 21 days when it can also be removed and replaced with a new frame fitted with foundation. Alternatively, a new frame fitted with foundation can be placed in the centre of the brood nest of the old hive at least a week or two before the technique is carried out. By that time this will probably be drawn out with fresh wax and contain brood. It can then be transferred to the new box with the queen at step 2 above. Good planning is behind all good beekeeping. 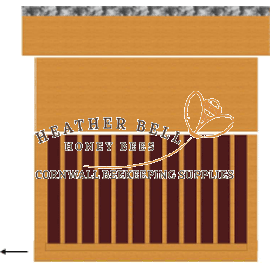 This is how the old hive may look at the start of the process. The arrow indicates the entrance direction. You may have more than one brood box but treat them as one box for the purposes of the technique. This is how the hive may look after the manipulation. The old brood box at the bottom with entrance closed. Above this are the queen excluder, the eke with the entrance open, the new brood box with queen, the feeder.